You should be arriving from the blog of my talented crafty friend, Jan ? If not, I encourage you to start from the beginning of our great blog hop. We are dedicating this blog hop to none other than the brilliant Meredith. Meredith's stint on the DYSU team was short & sweet but still we applaud her reasons to leave us. Meredith has a sweet personality always encouraging others and making them feel special. She is also a great artist and I can't do nothing but admire her great designs. Meredith..... Thanks for being such a great team mate, I hope you lots of wonderful things. I hope we keep in touch and that you play with us from time to time. Now to my project for this week. As you saw, our theme is Buttons. Since I only have like a million of them I decided to make my own instead of using from my stash. 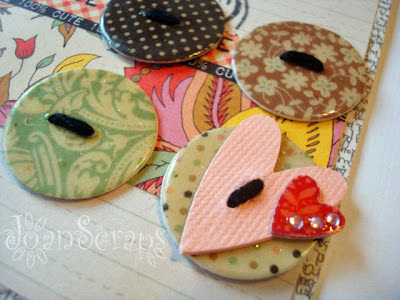 I made four paper buttons and only stamped a flourish from a very old Fancy Pants stamp set as a background. The rest is the magic of designer paper....Ohh, and I couldn't resist the urge to stitch a few crosses, it feels like a lifetime since I made some hand stitches to one of my cards. Don't forget to leave me some love and go ahead and play with us at DYSU!! Now off you to to see Guest Designer Marcy. Joan this is amazing. 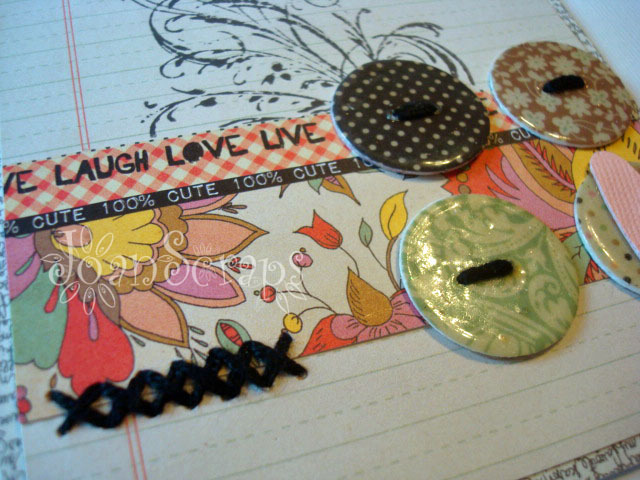 I LOVE those handmade buttons and the gorgeous swirl on the backing paper. This is a fab design! Love how the border and embellishments bring color to this otherwise neutral color schemed card. Hi Joan, what a great idea to make your own buttons. =) Love them! WOW Those paper buttons are pretty Awesome!! Fabulous card!!!! 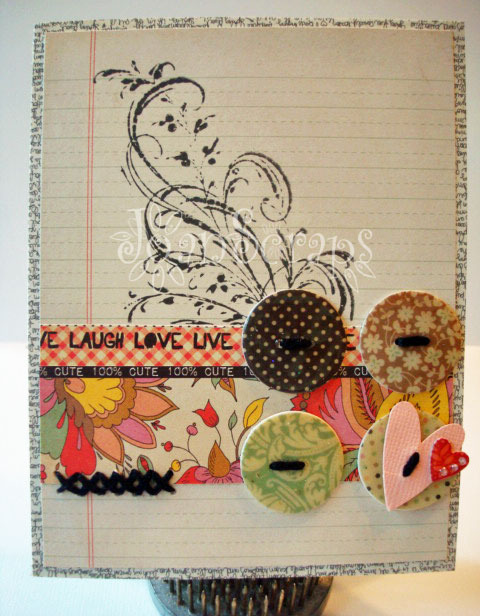 Very cute card...I think it's hilarious that you decided to make your own buttons instead of using your stash!! Great card! I really like the buttons you made! WOW! I love this card!! And your handmade buttons are AMAZING! Gorgeous, Joan. Loving those paper buttons! 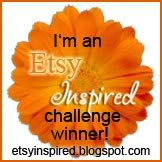 love your handmade buttons and your card !! What a beautiful card! Great idea to make buttons out of paper! Must remember that.